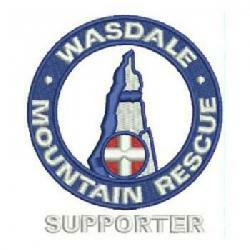 Wasdale Mountain Rescue Team welcomes applications for probationary membership from suitably skilled mountaineers. Please contact us for an application form. The rest of this page gives further details about the commitment and skill required to become a mountain rescuer. The range and magnitude of the tasks that are performed by WMRT require multi-skilled teamwork: no one training profile is appropriate to all team members. However, all team members must be able to function safely, both singly and in a group, in all the conditions and terrain that may apply to rescues, plus they must also have sufficient reserves and skills to positively contribute to the rescue process in one or more fields. As such, a minimum set of criteria for full membership is given below, with the expectation that these will be greatly exceeded in one or more areas. Enthusiasm and commitment to Mountain Rescue with the ability to respond rapidly to callouts at any time, competence and familiarity with the local fells in all conditions, and a suitable degree of physical fitness will be the main criteria for acceptance as a probationary and subsequently a full member. This will be initially judged on the content of an application form completed by the prospective member and a brief interview with the WMRT committee. The application form should identify in detail relevant recent experience, preferably in a logbook format, and references will be required. demonstration by the probationer of their basic suitability as a team member, as indicated above. Other than in exceptional circumstances the probationary period for every team member is a minimum of a year, so as to allow a full training round to be completed. The purpose of the training provided by WMRT is not to achieve the level of skill and fitness needed to meet the criteria listed in the Introduction section. It is beyond the resources of the team to provide all necessary training for a mountaineering novice to become a member, and it is incumbent on probationers to gain sufficient expertise in general mountaineering techniques etc. elsewhere. Probationers and full members attend the same training programme together, where probationers will usually be ‘buddied’ with an experienced member to ensure all the objectives of the training are adequately met. WMRT hold a regular training evening once every month, plus upwards of two full days each year, which provide practice in team working and the range of rescue techniques and apparatus used by the team. Additional training in special areas may be also available (e.g. advanced first aid, boat handling, helicopter operations) on additional days. A logbook is issued to each member to personally record this training. General reviews of training and operations are also held occasionally. To develop, maintain and visibly demonstrate these skills every full and probationary team member is expected to attend the majority of the team training opportunities. Probationers will also be expected to help with base operations during callouts. Acceptance as full team member will be solely the decision of the management committee of WMRT, and will be based on their judgment as to whether the criteria listed here are adequately met. It is formally decided on a simple majority of the committee, but this will rarely be the case as reservations of any committee member will be taken as significant; normally it will be a unanimous decision. The probationary period may be extended or special conditions applied at their discretion. No reasons for rejection need be given to the applicant and they will be held confidential from third parties in all cases. Reviews of the full team membership list are held frequently by the committee, and existing membership may likewise be rescinded if the criteria are no longer met, or the integrity, performance or reputation of the team is judged to be at risk. Appeals to the committee are permitted. A major consideration is frequently the attendance record as even the most skilful rescuer is of little use if they cannot be relied upon to contribute. Persons at risk of having their membership revoked will normally be informed in advance so as to allow opportunity for improvement or special circumstances to be made known. The following minimum qualifications for full membership (this is expected to be achieved during the probationary year) are derived from National MRC training guidelines plus the current (1992) WMRT training record/syllabus. It is a very succinct summary and is subject to interpretation and change in line with acknowledged ‘best practice’. Demonstrate physical fitness plus confidence on steep ground and in winter conditions. Know and do not exceed personal limits e.g. First aid, snow/ice, rock, etc. When appropriate carry, plus use and check, personal safety equipment e.g.. helmet, climbing harness, crampons, ice axe. Demonstrate basic diagnosis, triage, and treatment techniques. Preferably have MRC basic certificate or equivalent. Demonstrate knowledge of location, inventories and use of contents of different first aid sacs & bags. Know causes, avoidance, recognition and treatment. Demonstrate accuracy night & day using map & compass, in all weather conditions. Assemble and prepare for use, night or day, together with casualty bag and vacuum mat. Dismantle and re-attach pack frame. Assist with turn, lift and load of a casualty onto stretcher. Demonstrate casualty care during evacuation. Assist with loaded stretcher carry across varied terrain, inc. traversing, use of drag rope & wheel. Demonstrate safeguard of team members & casualty. Demonstrate use, coiling, inspection & care of static & dynamic rope types. Tie all common knots. Demonstrate personal and group protection on steep ground. Select/set up anchors (rock, snow & ice), rig and use for climbing belay & safety line. Abseil. Tie into harness for climbing. Set up lowering belay for stretcher & handlers, rig stretcher for horizontal & vertical lowers. Assist with lower as rope-handler. Assist with line and party searches, in all conditions. Discuss equipment required, boundaries, marking, reporting and use of dogs. Receive training from RAF and demonstrate safe practice for working around helicopters. Demonstrate knowledge of landing sites, flares, approaching, flight & crash procedures, winching and night working. Show awareness of base operations, fell party organisation & discipline, informant interrogation, tally system and restrictions on non-team members. Operate base, vehicle and fell sets. Pass messages accurately using correct protocol and channel selection. Understand use and positioning of relays. To apply to join the team, please contact the team secretary (use the “Contact Us” link at the top of the page) for an application form. On that form we are looking for evidence of regular hill walking and/or climbing at, different times of the year and in particular, and what experience you have of the Wasdale & Eskdale valleys. Subject to a suitable application form we will invite you to an interview with team members who will ask some more questions about what is written on the form and also about your general mountaineering experience. You may be asked to demonstrate a few practical skills such as tie some knots or show how you’d navigate with a map and compass. Finally, in common with a number of Lake District teams we now run a fell assessment day. This will be a full day out in the Wasdale or Eskdale valley with a range of activities. We only run this once a year, around April so that we can see everyone at the same time. Therefore you may have to wait few months between an interview and the assessment day.